The past two weeks have been surreal. In the span of a fortnight, I buried a beloved uncle, heard the news about the resignation of Bob Coy, and was installed as the Chair of the Oral Roberts University (ORU) Board of Trustees. 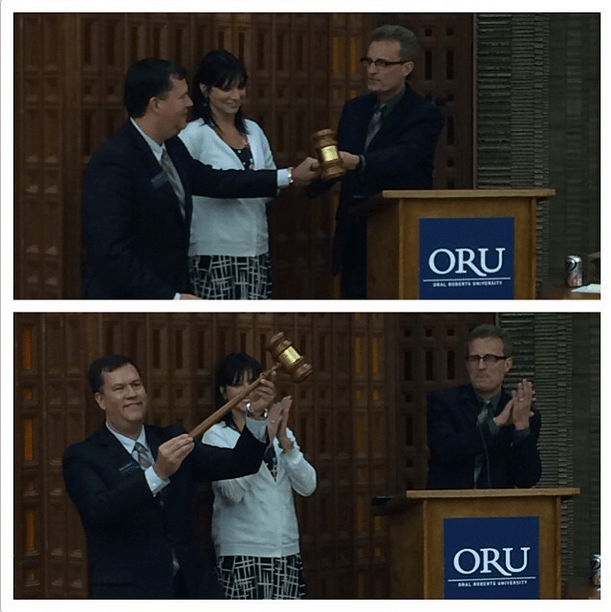 I was sequestered in ORU board meetings last week. When I reconnected to email and social media on my flight home, I was startled by the avalanche of texts, emails, posts, likes, RT’s and DM’s that flooded in. I was overwhelmed; equal parts exhilarated and troubled. The response to my blog post on Bob Coy’s moral failure has reminded me how devastating, personal and painful the fall of a leader is. Juxtaposed with my installation to the weighty position of Board Chair in the same week has reminded me how circumspect I need to be of myself. Anyone who knows me, whether on the tennis court, in the boardroom or discussing something over coffee knows that I like to win. I’m “that guy”—the one who never let his kids win at Monopoly, knocked over other skiers while racing my brother to the bottom of the slope, and tends to talk over people when trying to make a point. I am aggressive, competitive and driven. Whether it comes by nature or nurture, I don’t really know. All I do know is that I don’t like to lose. It troubles me how much I like this feeling of having “won” a new title. Yet my new position, while coming with a “title” that might make me think I’m a winner, in reality requires me to choose to lose. These are the qualities of who we should strive to be: poor in spirit; mourners; meek; merciful; pure; peacemakers; advocates for the persecuted and insulted. These are the ethics characteristic of the good Kingdom citizen. This is not just aspirational for a post-eschatological nature that I hope to one day attain, this is my here and now. How I act, speak and respond today. These are not the “winner” qualities of today’s leader, these are the loser “traits”of institutional bottom dwellers. How will I ever succeed at reconciling my nature to the contrast of Christ’s Kingdom prescript? Verse three caught my attention with, “for ‘the poor in spirit’ the Kingdom belongs to them.” The absurdity of this statement is spectacular and ridiculous in its scope and significance when you consider that the Lord is giving actual possessive power to His created beings. The King is granting managerial oversight of His realm to citizens who He deems as qualified . And this is not just referencing the ultimate Kingdom of a future dispensation, but the Kingdom of God here and now that we believers participate in. That’s the terrifying aspect behind both a Church pulpit and Chair position. They are spiritual offices in a carnal dispensation. The Chair I was recently elected to grants both real and tangible power and prestige. Thankfully, it is resident in a habitus of accountability, shared governance, and ruled by checks and balances. Thank God for the wisdom in those safeguards. Nonetheless, it is a possession, a pocket of human power that can be used, manipulated and usurped. My predecessor, Mart Green, handed me the gavel yesterday in a ceremonial rite of passage. While the world sees him representing power as a billionaire CEO, I see him as the personification of Kingdom ideals. One of my dearest friends and an accountability partner, he is driven, passionate and strong. By any calculus he has arrived where he is by hard work, determination and toughness. The paradoxical nature of Kingdom citizenship is that it welcomes us to tame our individual strengths and transform them into powerful tools for the common good. What most people don’t know is that Mart and his family have legally established that 90% of their wealth is given away and 10% is set aside in a trust for family that become widowed, orphaned or can’t work. As this decision so clearly shows, any personal“fruit” that comes off the “tree” for Mart and his family has to be earned by hard work. As a patron Chair whose family donated money to save ORU from closing its doors, many speculated that it would become Green University. There were hints and allegations that the family was “buying” the university. Instead, Mart has exhibited the heart and character of a servant, personifying the Sermon on the Mount. He has modeled that one who is impoverished in Spirit feels no claim to anything. Paul says in 1 Corinthians 4:7, “What do you have that you have not received?” Everything you have in which you can boast is a gift of God’s grace. At 4:44 AM yesterday my phone buzzed, I knew it could only either be my Dad calling from ministry meetings in Sri Lanka, or my friend Mart. Every morning without fail, Mart does virtual Scripture engagement with me and a few other men. The verse of the day, not surprisingly, fell in perfect harmony with my time of prayer and the Word. “Well, I should be really strong in this new role if feeling weak is the criteria,” I thought to myself. I pray that it does not take experiencing hardships to keep my heart and motives pure—to keep me “weak” so to speak. But I know in my heart that I am embarking on a public season in a position where power and prestige waft seductive. A few days ago, I was asked what my greatest concern was about moving into the Chair at ORU. I’ve been praying about that since then, and the Lord has reminded me again that my greatest concern should be ME. Rob your heart and your head align with God’s will as expressed in His Word. Such a symphony should be the goal of every believer. Know that I am praying for your ministry, not just with ORU, but more broadly, the many tasks God has bestowed upon you. The more power, the more prestige one receives, the more the enemy wants your downfall. So my prayer in particular is that God is so manifest in your life as to drown out any temptation.